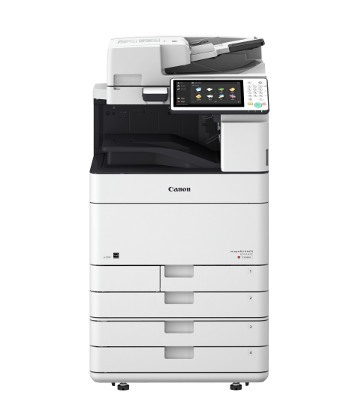 Canon has announced the release of its next generation multifunctional devices, the imageRUNNER ADVANCE C5500 Series. The five colour A3 multifunctional devices (imageRUNNER ADVANCE C5535, imageRUNNER ADVANCE C5535i, imageRUNNER ADVANCE C5540i, imageRUNNER ADVANCE C5550i and imageRUNNER ADVANCE C5560i) enhance productivity through intelligent document workflows and an intuitive user experience and help to address the total cost of print across a business. The series launches with the new imageRUNNER ADVANCE shared platform for next level print management, and usability. Canon’s unrivalled expertise and state-of-the-art imaging technologies deliver consistently striking quality. V2 (Vivid & Vibrant) imaging technology ensures outstanding colour quality output on a wide range of media, even at large volumes while its finishing capabilities impress time after time and will help your documents stand out from the rest. Dan Woodstock, Project Manager, Canon Europe commented: “The imageRUNNER ADVANCE C5500 series is designed to deliver maximum return on investment to businesses by minimising maintenance and downtime while boosting productivity. The value of print lies in its ability to create, manage and share documents and information seamlessly across an organisation. A huge paper capacity of 6,350 minimises time between replenishment while status notifications monitor performance at all times. The new imageRUNNER ADVANCE’s smart, adaptive technology ensures software can always be up to date for a consistently optimised performance. Canon’s device management tools offer centralised control across entire device fleets and ensure that all devices can be updated, inactive units can be remotely turned off, meter readings can be captured, and address books and printer drivers can be managed accordingly. Combined with Canon’s Managed Print Services (MPS), this proactive management and continual optimisation of print infrastructure and related business processes saves money, increases efficiency and improves overall productivity. The imageRUNNER ADVANCE C5500 series will be available across South Africa from September 2016 onwards.